Grace and truth came through Jesus Christ. Not one instead of the other; not one more than the other; but both together. That’s what we see in the beautiful life of Jesus and that’s what he expects to see in us. If we fail to give people both grace and truth, we will fail to be like Jesus, and we will fail to be the church. Jesus said that we need the truth to be “set free” of the lies and the misconceptions and the sins that entangle us. When I look back on my life, I am grateful for the people who graciously showed me grace and acceptance. But I am just as grateful for the persons who had the courage to speak truth into my life when it was not easy for them to speak it or pleasant for me to hear it. And in the name of grace, the church must never fail to proclaim the truth that people need to hear—even when it’s easier not to speak it. Why? Because Jesus said it’s the truth that sets us free to experience abundant life in this world and eternal life in the world to come. There are ways of truth-telling that do not set people free, bring life, or allow for the Spirit’s blessing. We have all seen harmful examples. That kind of truth-telling is not what we see in Jesus. And it’s not what people should see in us. Still, we need the grace of truth. We need the truth about our sin and our desperate condition without Christ. And we need the truth that Jesus is the Savior and that his blood can make us whole. In other words, people need what Wesley would call scriptural Christianity. Proclaim it and live it, and the church will prosper. Change it, make it acceptable to the spirit of the age, take away the “offense” of the gospel that all have sinned and that Jesus Christ is the name by which we must be saved, and the church will lose its power and fail to thrive. For over a century now, this is what liberal theology has been doing to the United Methodist Church—in the name of grace, removing the “offense of the gospel”—and the results have been disastrous. By liberal, I don’t mean people who see things a little differently than I do. I don’t mean people who have a slightly different understanding of the inspiration and authority of the Scriptures. I’m referring to views that are unorthodox on matters that John Wesley would say “strike at the root”: The Trinity, the uniqueness of Christ, the physical resurrection, salvation by grace alone, the need for and the possibility of sanctifying grace transforming our lives, and the continuing validity of the witness of the Scriptures for matters of faith and practice. When radical liberal theology comes to dominate a denomination or a geographical region within a denomination, it is destructive. How could it not be? What makes us effective as the church of Jesus Christ is not how clever we are, or how sincere we are, or even how hard we work. What makes us effective is the power and the anointing of God. And how can God grant his power or his anointing to those who proclaim a gospel “which is no gospel at all” (Galatians 1:7)? I know correlation does not imply causation, but I’m not naïve either. There is no doubt that as United Methodism drifted further from orthodoxy, we lost the power to have an impact upon our culture and to make disciples for Jesus Christ. Nearly half of our United Methodist churches in any given year do not receive a single member by profession of faith. Since our merger in 1968 we have lost the numerical equivalent of the entire Evangelical United Brethren Church. In 38 of the 50 United States, United Methodism has seen a decline in membership during the past 40 years. During this time the country’s population has increased by 100 million. That’s a 56 percent increase, but our membership has suffered a 21 percent decrease. In 1940, the average Methodist was 30 years old. Today, the average member is almost 60 years old. Since 1985, the number of elders under the age of 35 has dropped from 3,219 to less than 1,000. Today, less than seven percent of our elders are under 35. Is it any wonder that we cannot attract young people to the ministry? What young person wants to spend his or her life trying to save a church on life support when they know that the church is supposed to save the world? The premise of Children of Men, P.D. James’s novel that was adapted into a film by the same name, was that the human race has lost the power to reproduce itself. As the human race grew older and watched itself perish, people became cynical and hopeless—and they cherished their memories of how things had once been. We as a church are approaching that reality. We have lost the ability to reproduce ourselves at a healthy rate. And the statistics clearly show that our decline in attendance, our inability to add new members, and our failure to cultivate young leaders is worst where the church is most liberal. While knowing full well there is such a thing as dead orthodoxy—being right in your beliefs but wrong in your spirit—it is still necessary to ask what will happen to the UM Church if we fail to keep the church orthodox and true to the grace God has given to us to impart to the world. We could easily become a dying sect as the United Church of Christ is and the Episcopalians are fast becoming, where the ministers still dress up and play church on Sundays, but where the Spirit of God is absent, and the power to transform lives, much less a society, is gone. The church—its health, its witness, its ability to make disciples: that’s part of what is at stake here. There is one other element that is at stake if we fail to speak the truth in love: our own spiritual integrity. “The ultimate measure of a man is not where he stands in moments of comfort and convenience, but where he stands at times of challenge and controversy,” as the Rev. Dr. Martin Luther King Jr. said. Contending for the apostolic faith within United Methodism these days is not for the faint of heart. We are stewards of this most magnificent treasure that we call Wesleyan orthodoxy. God gave us this gift of grace and you and I are its trustees. If we fail to fight for it, we have failed our trust. Although there are many different ways to work for the renewal and reform of the UM Church, we all must do our part. If you believe in the faith once and for all delivered to the saints and believe it is the hope of the world, you must be willing to stand up and fight for it. We need to ask what will make the United Methodist family whole, and what we can do. First, we must be connected and engaged. When the opportunity arises within our denomination, listen to opposing opinions with sincerity and with a desire to learn. Dialogue with openness and honesty. But be sure to listen for the issues beneath the issues and dialogue about the matters that matter—the deeper issues that truly divide us. For example, there is a widely-held misconception that homosexuality is the issue that divides our denomination. If it were, that would be enough of a challenge. However, it is only the presenting issue. 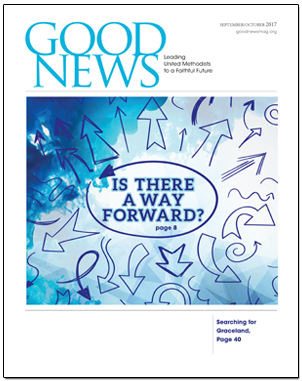 As I pointed out in the last issue of Good News, the deeper issues deal with the nature of moral truth, the authority of the Scriptures, the revelatory work of the Holy Spirit, and the uniqueness of Christ. These are not small matters that can be ignored or denied for the sake of unity. They must be addressed or true unity will be impossible. Of course, people can disagree with us and not be “almost” Christians or nonchristians. But Wesley was attacked by those outside of the church and inside the church when he promoted and defended scriptural Christianity. He came to expect it. And so should we. In the midst of denominational dialogue sessions, some United Methodists have been told that their position was mean-spirited. Let me be very clear about this. Those of us in the renewal movements do not believe in speaking ill of anyone because of ethnicity or gender or sexual practice. We do not believe that any one sin is worse than any other. We stand firm on the belief that all persons are of sacred worth because each one is created in the image of God and Christ died for all. In the midst of dialogue, some United Methodists have been told their perspective was radical, right-wing, or part of the fringe. But since when is it right-wing to believe that the Bible is God’s Word? When was it declared radical to affirm the United Methodist Book of Discipline? When did it become extreme to want our covenant to be honored and upheld? When did fidelity and faithfulness to the Scriptures become anything but mainstream Wesleyan? Second, pray. This is a wonderful moment in the United Methodist Church. There is a new breeze of the Holy Spirit blowing. There are new bishops who display moral courage and are open to the leading of the Holy Spirit. Pray that they will continue to change what it means to be a bishop in the United Methodist Church, and that being a bishop in the United Methodist Church will not change them. Pray for the members of the Judicial Council, that they will continue to interpret the Discipline fairly. Pray for faithful souls to be encouraged. Pray that God will not let them walk away or give up. Pray that those who lead renewal and reform movements will be worthy of those who look to us for leadership. Most importantly, pray that God will revive and unite the Body of Christ. Third, we must proclaim the truth. In what you say, in what you do, and in how you say and do it, proclaim the truth. There is power in the grace of the truth. There is power to convert the lost. And there is power to change the minds of those who deny the clear teaching of the Scriptures and the uniqueness of Christ. So proclaim the truth humbly but confidently, winsomely but boldly. In his book Jesus Rediscovered, Malcolm Muggeridge states that with every great book even while you are learning something new, your heart is telling you that you already knew this to be true. Fourth, we must be part of the change. I know politics (secular and ecclesiastical) can be a dirty business, but it shouldn’t be, and it doesn’t have to be. Politics can be just the process by which people organize themselves and agree upon their priorities. General Conferences are critically important in determining the direction of our denomination. And we elect a Judicial Council that will interpret and enforce what we have agreed upon. We must get involved, learn how the system works, and use it to make a difference for the cause of the gospel. It’s not our place to scar others. But we must be willing to be scarred. We’re not concerned with trivialities, but about the faith once and for all delivered to the saints. It is our time to be faithful and, if necessary, to pay a price. Our Lord Jesus could not fulfill his mission without being scarred. In fact, after his resurrection, the only part of himself he insisted that others view were his scars. When Methodism began in the New World, it began with heroes who were willing to be scarred. Of the first 700 Methodists to die in the colonies and then in the newly formed United States—facing pestilence and disease, the elements, the rigors of the open road, and physical attacks—nearly one-half of them died before the age of 30 and nearly two-thirds died before they had served 12 years. Every year they would gather at Annual Conference and sing the words we take for granted, “And are we yet alive and see each other’s face….” And they would look around the room to see who was yet alive and who that year had given their lives in the service of God. They were heroes. And they expected to pay a price and to be wounded and scarred in their service to Christ. In the last century as the church drifted further from its biblical core and Wesleyan heritage, there were those such as Chuck Keyser, David Jessup, Ed Robb, Diane Knippers, and Bill Hinson who joined the ranks of departed heroes, faithful in getting the ship back on course. And now it’s our turn. Although the Holy Spirit does not need us to do his work, for some reason God has chosen to work through people like us—if only we are willing. And if you are faithful and if you are scarred, be grateful and count it your greatest privilege. This is how the work of grace and truth has always been served and we can expect nothing else in our time. Rob Renfroe is the new president and publisher of Good News. He is the pastor of adult discipleship at The Woodlands United Methodist Church in The Woodlands, Texas, and is the former president of The Confessing Movement within the United Methodist Church.